Welcome to Two Red Threads. 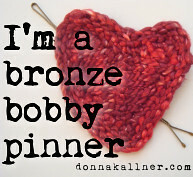 I'm Donna Kallner, a full-time artist, writer and fiber arts instructor. My mixed media textiles take a contemporary approach to fiber techniques and technologies, using them to honor ancient traditions and tell timeless stories. You can learn more at my web site, but let me sum up a couple of things. With 25 years of experience in adult education -- first as a professional whitewater canoe instructor (no kidding!) and as a fiber arts instructor for more than 10 years -- I'm a passionate advocate for lifelong learning. I believe we're all a little healthier and happier when we have some creative outlet. My job is to present possibilities and gently guide others along paths that lead to a sense of accomplishment and creative satisfaction. I'm also an avid learner -- and not just of fiber techniques. Seeing how things are made fascinates me. I'm the person peeking over your shoulder in the kitchen, lagging behind on a factory tour, loading up at the library. The world is an amazing place, where one idea leads to another and all those paths connect. The creative challenges of learning, teaching and writing are important catalysts for my studio work. All this brings me into contact with some of the nicest, most interesting and inspiring people in the world. You might meet some of those people, or reconnect with people you already know, in the pages of this blog. I hope you'll add your voice to the conversation.You can reach me by email, or by leaving a comment to a post. As always, thanks for reading Two Red Threads!